At first sight the year 2013 may seem to have been an annus horribilis for the Boeing 787 program with the months-long grounding of the fleet due to the lithium-ion batteries heat runaway issue, the fires that some of the aircraft in the operating fleet suffered, etc. 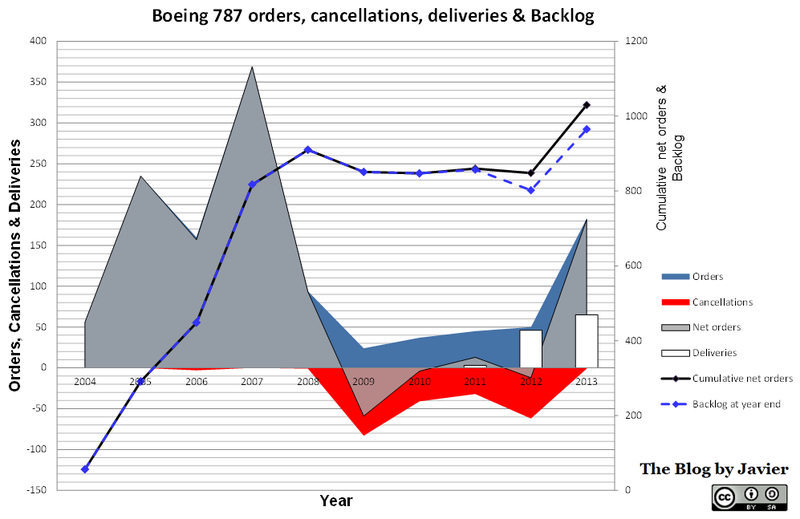 On the other hand, after 4 years of sales impasse (from 2009 to 2012, inclusive), in which the cumulative net orders of those 4 years stood at a negative 62 aircraft cancelled, in 2013 Boeing recorded 183 new orders against just a single cancellation. Thus, 182 net orders. That is the 3rd best year in sales since the program was launched in 2004. Last year, I wrote a post wondering whether the grounding of the fleet could be translated into some cancellations. Well, it didn’t so far. Quite the contrary, it got some big contracts from American Airlines, Singapore Airlines, Etihad, British Airways and GECAS. In last year’s post I included a graphic that I have updated for this post, in order to reflect this recovery and have in one snapshot a view of the orders, cancellations, (net orders), deliveries and backlog. 787 orders, cancellations, deliveries and backlog through 2013.